The Congress on Friday accused the Narendra Modi government of not taking stakeholders into confidence before signing the Naga peace accord and ignoring the basic principles of cooperative federalism.The central government was keeping the entire nation in the dark on the accord, party spokesman Randeep Surjewala said at a press conference here attended by the chief ministers of Congress ruled states of Assam, Arunachal Pradesh and Manipur. "The BJP is telling a blatant lie to the country that it invited the Congress chief ministers of northeastern region for consultation before it reached the Naga peace accord," he said. 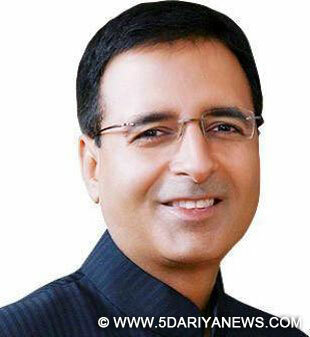 Surjewala said the Congress was not against any peace process concerning the region, but it will not allow this to happen without states concerned being taken into confidence.The Congress leader also accused the central government of not putting something as important as a peace accord before parliament specially when it was in session. "Nobody knows what it (accord) contains... not even his own ministers have any idea about it," Surjewala said.It was "unfortunate" and the government must not ignore the constitutional norms and practices in cases like these, he added.The Naga peace accord, between the central government and the NSCN (IM) was signed on August 3 in the presence of the prime minister.